Harvesting rice by hand in The Philippines. Rice plays a key role in global food security, particularly in Asia, where 90 percent of the world’s rice is grown and eaten. By 2050, Asia’s population is estimated to grow by one billion to 5.2 billion people, who will continue to depend on rice as their major staple food. But with rising demand for rice has also come increasing salinity, droughts and other stresses, along with decreasing areas of land available for farming the crop. And that’s why the CGIAR Generation Challenge Programme (GCP) placed a major focus on rice throughout its 10 years of existence. 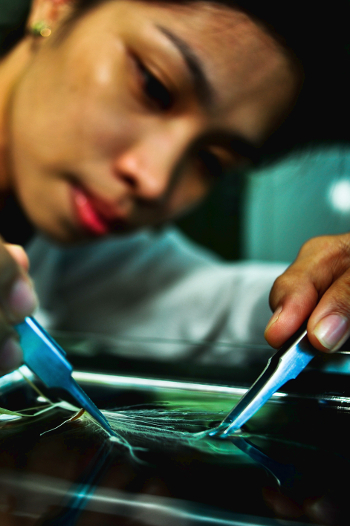 Key ingredient in the rice research fest was GCP’s relationship with the International Rice Research Institute (IRRI), headquartered in The Philippines. GCP supported IRRI in its endeavours to use the latest molecular plant-breeding techniques, along with traditional plant-breeding tools, to develop rice crops better able to cope with various stresses and still be productive. “These ‘super’ crops will revolutionise rice farming,” says IRRI Director General Robert Zeigler, who was also the first Director of GCP. For more on GCP’s rice research see our Sunset Story ‘The power of rice unlocked’. 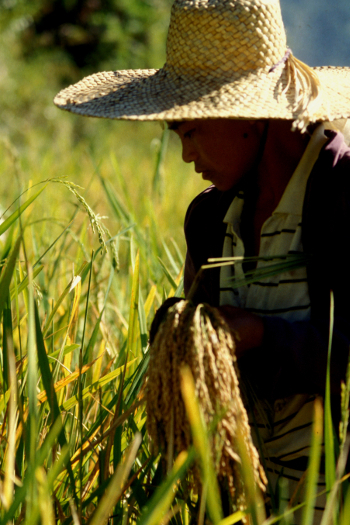 Climate change is one of the major threats facing rice production. As sea levels rise, salt water enters further up rivers with the high tides and affects rice production areas. Each year in Bangladesh, during the boro rice season from November to May, salinity is so high that a white film of salt covers the country’s coastal paddy fields. For Bangladeshi farmers, this white colour is a warning sign that their land is ‘sick’. Around the world, Bangladesh, India, Myanmar and parts of Africa are most affected by increasing salinity. Right from the beginning of GCP, salinity was a problem firmly on the rice research agenda. Highly saline soils in India (left), and a close-up showing a surface crust of salt on afflicted soil (right). Leading this research was IRRI plant physiologist Abdelbagi Ismail, who dreamed of the ‘super’ rice crop that could “tolerate salinity, drought and submergence”. Abdelbagi has managed and overseen most of the progress made during the discovery of a major genetic region, or quantitative trait locus (QTL), associated with salinity tolerance and named Saltol. Abdelbagi Ismail examines rice plants in the field in Bangladesh. Its insertion into well-known rice varieties used by farmers in Bangladesh, Indonesia and The Philippines is part of the revolution taking place in rice research. Abdelbagi says Saltol was mapped and markers were developed for its use in breeding more salt-tolerant rice varieties. Its salt-tolerance code is now being transferred into several varieties evaluated with IRRI partners in South and Southeast Asia. “These projects also provided opportunities for both degree training and non-degree training to several of our partners in the countries involved,” he adds. “Partnerships are crucial for us to build the capacity of the researchers in these countries and to ensure our outputs and outcomes reach the farmers that need them. Having developed new lines following the discovery of the Saltol QTL, Abdelbagi’s GCP-supported team trained plant breeders in country programmes to successfully breed for salt tolerance and other stresses. In this way, Abdelbagi says, they are improving the capacity of researchers in developing countries to take up new breeding techniques, such as the use of molecular markers. “This can reduce the time it takes to breed new varieties, from six to ten years at the moment, down to two or three years,” he says. This means that benefits to smallholder rice farmers struggling with salinity will happen sooner rather than later. And Abdelbagi credits GCP’s partnership approach, working directly with the countries in need, for the success so far. “The salt-tolerant varieties are now being widely distributed,” he says. “Some of these varieties have doubled farmers’ productivity in affected areas. “The work developed technologies of value to our needy farmers. More than 60 percent of rainfed lowland rice is produced on poor and problem soils, including those that are naturally low in phosphorus. This is an essential for nutrient growing crops, but providing phosphorus through fertilisers is costly and unfeasible for many smallholder rice growers. IRRI’s Sheryl Catausan prepares the roots of a rice plant for scanning as part of the work of the PSTOL1, phosphorus uptake research team at IRRI. This problem was the focus of GCP’s rice phosphorus-uptake project led by IRRI molecular biologist Sigrid Heuer. The project was enormously successful, with its discovery of the PSTOL1 (‘phosphorus starvation tolerance 1’) gene within the Pup1 locus, which was published in the prestigious journal Nature. Following the PSTOL1 discovery, researchers are now working with developing-country researchers and extension agencies to help them understand how to breed local varieties of rice that can be grown in phosphorus-deficient soils. They are also collaborating with other crop breeders looking to breed similar maize, sorghum and wheat varieties. Tobias Kretzschmar, a molecular biologist with IRRI, says that GCP’s partnership approach was the key to the project having an impact on the rice farmers who needed it most. “For me, the collaborations that were forged through these inter-institutional projects made the difference,” he says. Rice is a crop that not only needs water, but loves water. So developing a drought-tolerant rice variety is a quest to find a seemingly impossible gene. However, GCP-supported researchers did just that: they solved the insoluble. “They were very successful in terms of getting drought tolerance,” says Hei Leung of IRRI, who was GCP Subprogramme Leader for the Comparative Genomics Research Initiative between 2004 and 2007, and also a Principal Investigator for the Rice Research Initiative. “They’re now getting a 1.5 tonne rice yield advantage under water stress. I mean, that’s unheard of! This is a crop that needs water. As Subprogramme Leader, Hei played a critical role in the creation, management, delivery and communication of a wide portfolio of research projects. 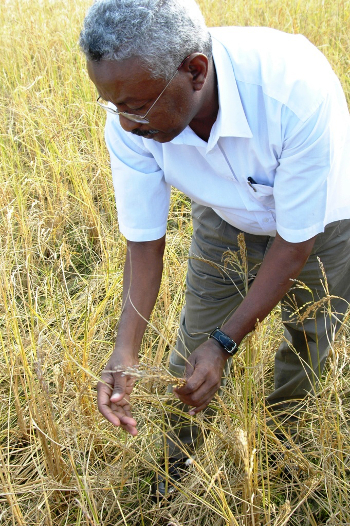 He credits the nature of how GCP was set up for accelerating the breeding programme for drought-tolerant rice. “The advantage of GCP is that it is run by a small group of people who can make fast decisions,” he says. “This means they can respond to the needs of researchers: ‘Okay, we are going to invest on that. We’re going to have a meeting on this’. 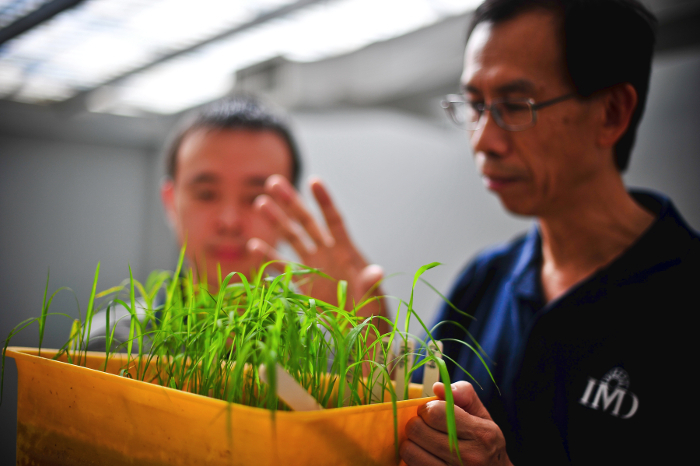 Hei Leung (right) explains rice screening processes to a visiting scholar at IRRI. Tobias says one of the main objectives of GCP and IRRI is to make genetic stocks available to breeders, particularly in developing countries. In fact, this idea of protecting the future through genetic material was influential in the choice of GCP as a CGIAR Challenge Program name. Hei, who was involved from the start with GCP, talks about the meeting in a Rome pizzeria where participants came up with the name: “When we talk about ‘generation’, we are really talking about the work we do with genetic diversity; it is about the future generation,” he says. Part of that future generation is about sharing genetic resources or stocks, but first the genetic diversity of such stocks needs to be characterised. 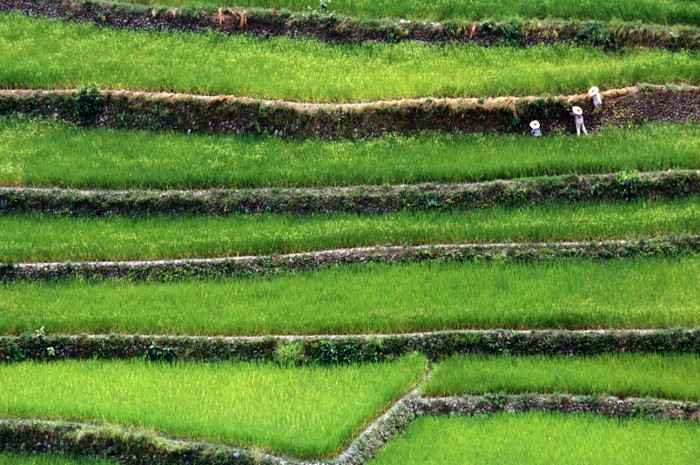 Hei remembers that one of the first GCP projects in 2004 brought together researchers in various countries to characterise the genetic diversity of various crops, including rice. “But everyone was using different genotyping platforms and markers, and the technology back then was not what we have now,” he recalls. “So we spent a lot of resources getting poor quality data. In a sense, it was a failure. On the other hand, it was also a success because we alerted people to the importance of characterising diversity in every single crop. The whole concept of getting all the national partners doing genetic resource characterisation is a good one. Abdelbagi agrees that characterising genetic diversity is essential, and adds that making such genetic stocks readily available to breeders is also vital. Abdelbagi adds that another big challenge has been to provide country partners with materials and DNA markers for marker-assisted selection programmes and to make sure these were properly used in breeding programmes. “We solved this by hosting a workshop at IRRI and with continued visits with GCP collaborators,” he says. Rice terraces in Ifugao Province in The Philippines. 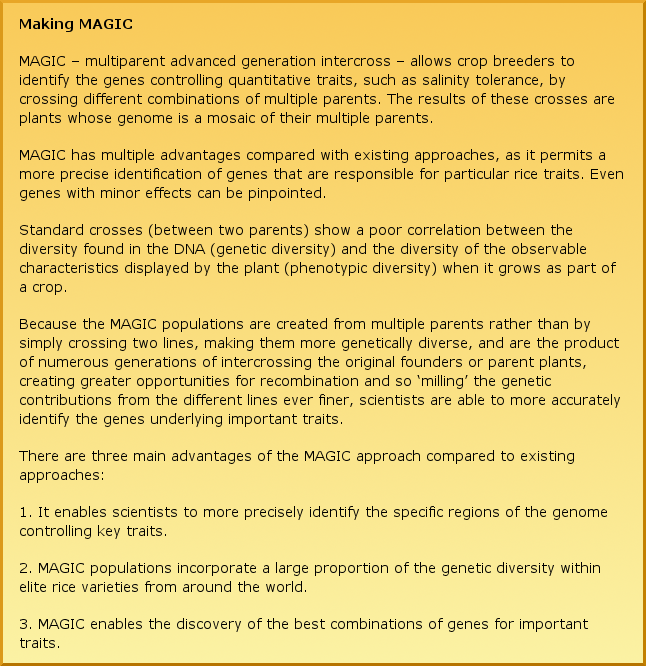 Hei says that the GCP project he’s most passionate about, and one that leaves a lasting legacy, is the development of multiparent advanced generation intercross (MAGIC) populations, which will potentially yield lines that are tolerant to environmental stresses, grow well in poor soils and produce better quality grain. GCP funded the development of four kinds of rice populations, including indica MAGIC, which is the most advanced of the MAGIC populations developed so far. These populations contain multiple desirable traits, including: blast and bacterial blight-resistance, salinity and submergence tolerance and grain quality. 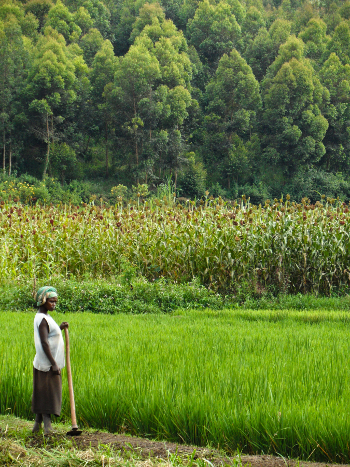 Rice farmer in her field in Rwanda. Robert Zeigler’s dream of a new rice Green Revolution with ‘super crops’ is coming true, thanks in part to GCP’s focus on combining cutting-edge molecular plant-breeding techniques with conventional plant breeding. IRRI researchers like Abdelbagi agree that new plant-breeding techniques, such as those fostered by GCP, are making ‘super’ crops more likely: “I’m committed to understand how plants can be manipulated to adapt to, and better tolerate, extreme environmental stresses, which seems more feasible today than it has ever been before. And for Hei, GCP’s 10-year legacy is not just about the technology but also about the people.